In 1974 I opened a drum shop in St. Louis, Harlan Drums, Inc. We carried all the major brands, but we also carried a lot of the small specialty products like Vic Firth, Tom Gauger, Saul Goodman, etc. One day I was at Powell Symphony Hall where the St. Louis Symphony rehearsed and performed. The percussionists were friends and teachers of mine. 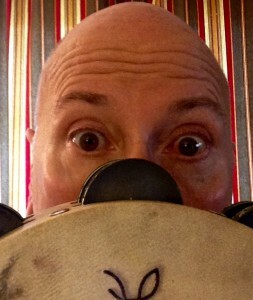 One day one of the guys was complaining that he couldn’t find a tambourine they liked. They gave me this old, beat up instrument from the 1920’s that had a beautiful sound. I played with that instrument and Rich O’Donnell, the principal percussionist, introduced me to a great guy named Pete Buckert who owned a small machine shop. He looked at the jingles and said “German Silver”. After months of experimenting and showing the guys at the Orchestra my latest iterations, I came up with an instrument that everyone liked. 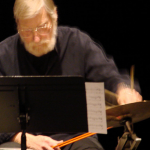 Three of the percussionists, Tom Stubbs, Rick Holmes and John Kasica were former Julliard students. They said you need to send this to our teacher, Buster Bailey. I did. I did and The Harlan Tambourine was officially born. There is a simple principle for creating different timbres on percussion instruments: the lighter the striker, (drum stick, triangle beater, etc. ), the “brighter” the sound: (having more highs). The heavier, ( more massive) the beater, the “darker” the sound, (more lows are created). In January of 1971, stimulated by a conversation with Maestro Jean Morel, (percussionist on many of Stravinsky’s early works), I began experimenting with triangle beaters that could instantly produce many different timbres, at any amplitude by simply moving the beater a little from its tip to the full body of the striking area. The exponential curve of the striking area maximized its potential. After making a few sets for my colleagues, it was marketed by Kevin Harlan’s company in 1975, but lacking an efficient means of producing them, a limited number of the beaters were produced. This beater was used on all St. Louis Symphony Orchestra concert, tours and recordings from 1972 ’till 2002. We have gone “back to the future” and have replicated the original shape married to new production techniques to produce what I think are truly great Triangle Beaters.